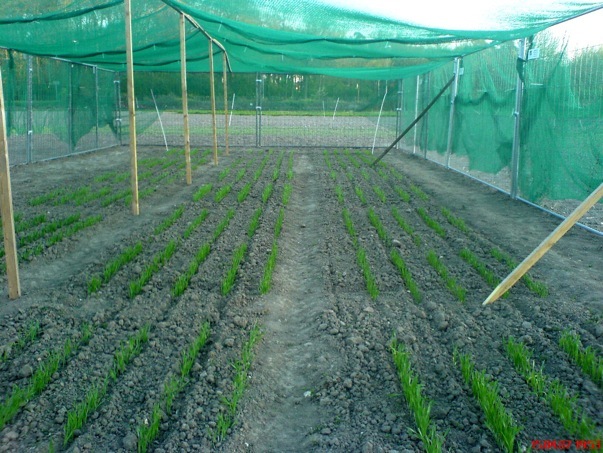 The aim of the present study was to assess possible adverse effects of transgene expression in leaves of field-grown barley relative to i) the influence of genetic background and ii) effect of plant interaction with arbuscular mycorrhizal fungi. We conducted parallel transcript profiling, metabolome profiling and metabolic fingerprinting of wild-type accessions and barley (Hordeum vulgare L.) transgenics with i) seed-specific expression of (1,3-1,4)-ß-glucanase (GluB) being introgressed from the cultivar Golden Promise (GP) into the cultivar Baronesse (B) as well as of transgenics in the GP background with ii) ubiquitous expression of codon-optimized Trichoderma harzianum endochitinase (ChGP) that we generated and characterized in the course of the study. We found more than 1600 differential transcripts between the varieties GP and B, with defense genes being strongly overrepresented in B, indicating a divergent response to subclinical pathogen challenge in the field. In contrast, no statistically significant differences between ChGP and GP could be detected based on transcriptome or metabolome analysis. Over the last two years, the incidence of scientific field trials being vandalised and destroyed by radical anti-biotechnology activists has drastically increased. It hit a record in 2009, with 42% of field trials in Germany being destroyed – despite expensive security and surveillance measures at the field sites, and extensive communication efforts by scientists to inform the general public, both before and during the release experiments. Our field trials were the target of activist groups in 2006, 2007, 2008, and 2009. The destruction was always up to 30% of plants. In 2009, after the complete destruction, we could save the experiment only upon complete resowing. Futhermore, due to political unclearities it was always difficult to get the final approval for the sowing, although the general approval for the biosafety project and field release had been granted. Especially since 2008 it was very difficult to get the final go for the release. For instance in 2009, we experienced a dramatic delay resulting in a late sowing of barley on May 12 (optimal barley sowing is at the end of March until early April). The cost for the experiments increased dramatically due to the fact that we needed to protect field sites day and night during the whole growing period. Due to the destructions the project was prolonged for 2 years. Important scientific goals of the project could not be reached, including some epidemiologic studies related to the resistance status of genetically modified barley plants. The barley is resistant to devastating Rhizoctoni solani root rot. Using this barley could reduce pesticides and by the same time support ecologically desirable reduced-tillage strategies that save soil structure and microbial communities.